What is a pink flamingo? Or better yet, who? Today, I heard quacking, but then I realized I was just listening in the wrong language. Of late, I have been observing the fowl world and more specifically communication, adaptation and behavioural strategies. My name is Lynn Armstrong. I am such a pink flamingo, working in brown duck world. As a strategic planner and writer over the past 16 years, I have worked with some of the brightest minds, helping them to forge new directions and bringing those futures to life. I am particularly interested in the contrast between the flamingo and the brown duck because I find these feathered friends to be very familiar with our own species in the world of work and life. When one thinks of the flamingo, we think of bright colors. The brown duck is often associated with predictable (I did not say dull), guarded behaviour. The flamingo is thought to be gregarious, fabulous, fiery and flamboyant. The brown duck is staid, serious, safe (dull?) in appearance. The flamingo celebrates and dances, while the brown duck perches and waddles. Flamingos like to party in mobs (we have all seen the ever so popular lawn flamingos that often converges in packs of 40 or 50) whereas brown decks tend to prefer the linear approach to moving together. Finally, flamingos are revered for their beauty; brown ducks make good decoys. This column will explore how these two birds of a feather can work together through understanding and strategy. To begin, here some observations and facts about pink flamingos. 1. Flamingos have what it takes to survive a caustic environment. 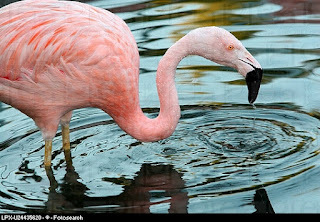 The flamingo is often referred to as "Fire Birds" and are some of the only creatures designed to survive in the caustic environment of a volcanic lake. Equipped with a filter-feeding system unlike any other bird on earth, flamingos’ beaks have evolved to skim tiny algae from the water's surface. By swinging their upside-down heads from side to side or swishing water with their fat tongues, flamingos siphon the lake water through their filters to trap algae. They can filter as many as 20 beakfuls of algae-rich water in a single second. This unique feeding system gives flamingos a certain security and competitive edge. While they must watch out for predators like jackals or eagles, they compete with no other animals for food. 2. Flamingos have balance and appreciate a little Zen, now and then. 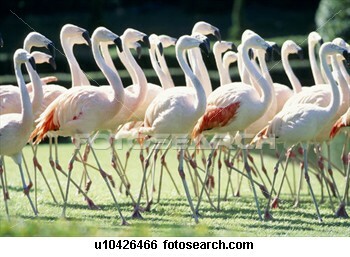 Flamingos often stand on one leg, the other tucked beneath the body. The reason for this behaviour is not fully understood. Some suggest that the flamingo, like some other animals, has the ability to have half of its body go into a state of sleep, and when one side is rested, the flamingo will switch legs and then let the other half sleep, but this has not been proven. Recent research has indicated that standing on one leg may allow the birds to conserve more body heat, given they spend a significant amount of time wading in cold water. 3. Flamingos flourish famously and with fervour. Flamingos have no firm mating season. The parents build a mud-cone nest that holds one egg, which males and females take turns incubating. When the chicks hatch, their parents must take care to keep the infants from falling off the nest into the caustic lake. When they are old enough to venture from the nest, chicks join groups of thousands and explore their home lakes, waiting for their parents to bring them mouthfuls of water at mealtimes. Flamingos hatch with grey plumage, but adults range from light pink to bright red hue due to aqueous bacteria and beta carotene obtained from their food supply. A well-fed, healthy flamingo is more vibrantly coloured and thus a more desirable mate. A white or pale flamingo, however, is usually unhealthy or malnourished. Captive flamingos are a notable exception; many turn a pale pink as they are not fed carotene at levels comparable to the wild. 5. Flamingos love to flash mob dance. Posturing and signalling with their wings, bowing and bending their necks, running back and forth as a group, and then suddenly taking flight to wheel around the edges of the lake -- a crowd of dancing flamingos is one of the strangest, most breathtaking sights in the natural world. Is it a mating ritual? Are the birds burning up excess energy? Or do they do it simply for fun? No one is really sure.